Features an electronic electric ignition system for push-button start-ups. Both flame and temperature can be adjusted precisely. Provides up to two hours of burn time before refill is required. High temperature 2500 degree flame. Uses butane only, not included. Enjoy finger tip flame control! 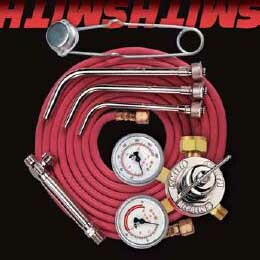 SMITH Handi Heetï¿½ TORCH KIT: Fits "B" Acetylene Tank. plated solid brass torch body plus # 1, # 2 & # 3 Tips w/Dual O ring seat. Good for brazing small pieces. Good for most general brazing / silver smithing. Good for brazing medium to large pieces like bracelets & buckles. Good for casting and for brazing large service ware.